Seen at the 1967 Brighton Coach rally this particular coach is not all that it appears to be. Built to the specification of Don Janes the owner of Whitefriars Coaches of Wembley it started life as a normal 1966 Ford R226 chassis. But was then rebuilt to Mr Janes specification which consisted of a Cummins Vale 7.7 litre V8 diesel producing, (I think) 185 bhp at 3300 RPM coupled to an Allison 6 speed fully automatic gearbox with built in hydraulic retarder. There was also a radiator from a Guy lorry and the front axle was from a Dodge K 900 lorry with power assisted steering and an electric retarder. 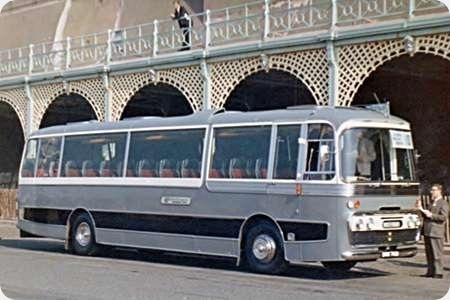 It was then fitted with a 1967 Plaxton Panorama 1 C52F coach body, Mr Janes then drove it to become Coach Driver of the Year, the Cummins badge can be seen on the front grill. Seems strange that someone should go to all that trouble, and no doubt considerable expense, to hang all that hardware on what is normally considered a lightweight chassis. I would imagine the frame needed some extra stiffening to take the added weight. As I understand it Mr Janes had access to a former Texaco Dodge K-series that had been written off, whence the engine front axle and gearbox, the power steering was integral with the axle as was the retarder with the gearbox.